The original bulldog was not only used for bullbating but was also used as an all-around working dog by small farmers and ranchers. Towards the end of World War II the American Bulldog almost went completely extinct in the United States and are only here today by the efforts of a returning war vet, John D. Johnson and another breeder, Alan Scott. Today American Bulldogs are used as "hog dogs", cattle drovers, and as working or sport canines. There are two distinct types of American Bulldogs, the Bully and the Standard. The two types of American Bulldogs came from two different standards by Johnson and Scott. The American Bulldog was commonly used in Southern America to deal with feral pigs. 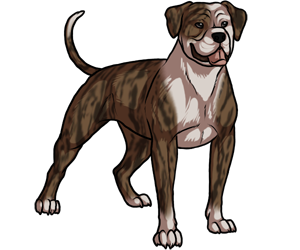 The American bulldog was originally known as the American Pit Bulldog but was changed due to confusion with the American Pit Bull Terrier.